United® Real Estate, a rapidly growing real estate organization, announces the addition of a new team member joining its Louisville office. 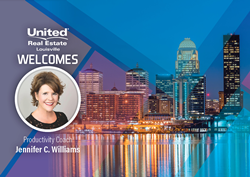 Jennifer C. Williams will be joining United Real Estate | Louisville as their new Productivity Coach and will assist in providing agents dedicated comprehensive training, a pillar of United’s model. As a 25-year veteran of the real estate industry, Jennifer C. Williams, has been active in numerous facets of the business, including extensive experience in new construction, investments and sales management. Jennifer holds a Bachelor of Science Degree in Business Management and for the past six years has held the position of Principal Broker at the largest Keller Williams firm in Lexington, KY.
United Real Estate | Louisville currently has 150 agents and is one of the fastest growing brokerages in the local market. The comprehensive training, tools, and technology offered at United Real Estate | Louisville are designed specifically for agent success. Accompanied by a unique 100% commission structure, the resources United Real Estate | Louisville provides its agents paves the way for a bright future in the industry. The addition of Jennifer to the Louisville team is a promising one and her expertise is sure to enhance the overall productivity of the office. Agents interested in learning about career opportunities with United Real Estate | Louisville can call 502-232-3868 or visit JoinUnitedRealEstateLouisville.com. To learn more about United Real Estate’s franchising opportunities, visit GrowWithUnited.com or call 888-960-0606. United Real Estate – a division of the United Real Estate Group – was founded with the purpose of offering solutions to the challenges facing agents in the residential real estate brokerage industry. Providing the latest training, marketing and technology tools to both agents and brokers under a 100-percent commission strategy, United Real Estate makes it more profitable for an agent to sell real estate and for real estate brokers to leverage a complete system to better grow a successful, thriving real estate brokerage. Named as a "frontrunner" in the real estate industry in 2013, "part of the next generation of real estate brokers" in 2014 by the Swanepoel TRENDS Report, as well as being listed in the "Power 200 Most Influential" from 2015-2018 by Swanepoel Power 200. United Real Estate has more than 85 offices and over 3,800 agents. Through a worldwide franchise solution, United continues to rapidly expand and was named to the Inc. 5000 fastest growing private companies in 2015-2017 and 2018 Entrepreneur Franchise 500® - Ranked in Top 100 New Franchises, Top Franchises & Top Brands. Driven by an unwavering commitment to giving back, a pillar of United's core values and guiding principles, United Real Estate is proud to support and partner with Autism Speaks, the world's leading autism science and advocacy organization, as United's charity of choice.